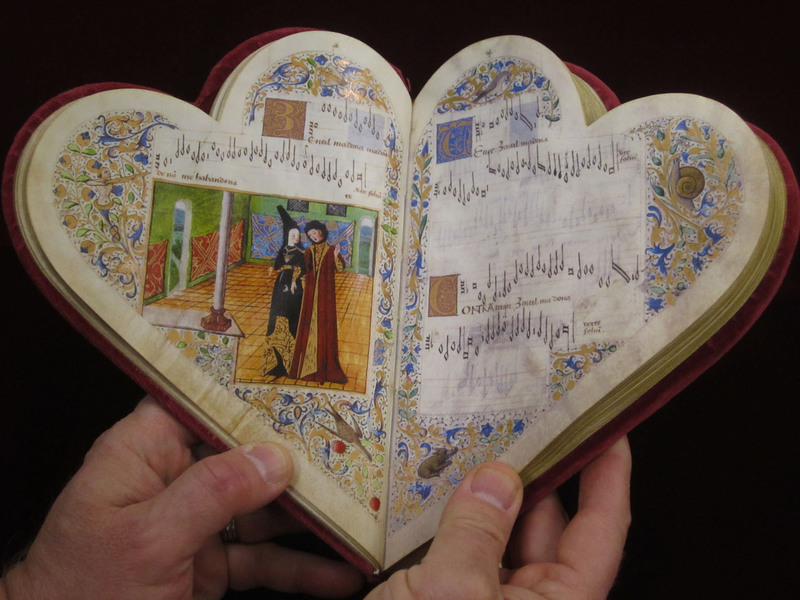 Heart-shaped book of hours from France, 15th century. BnF MS Latin 10536. Bibliotheque Nationale de France. I found this heart-shaped book of hours on pinterest and was immediately intrigued, so I’ve started researching heart-shaped (or cordiform) manuscripts in general. So far, I’ve found a few, but none are accompanied by an abundance of information. So far, I’ve found four thanks to this post, which has some great photos, too. I particularly enjoyed a Danish book of ballads made in the 1550s and now owned by the Royal Library of Denmark (KB, Thott 1510). The Chansonnier Cordiforme (BnF MS Rothschild, Occ. 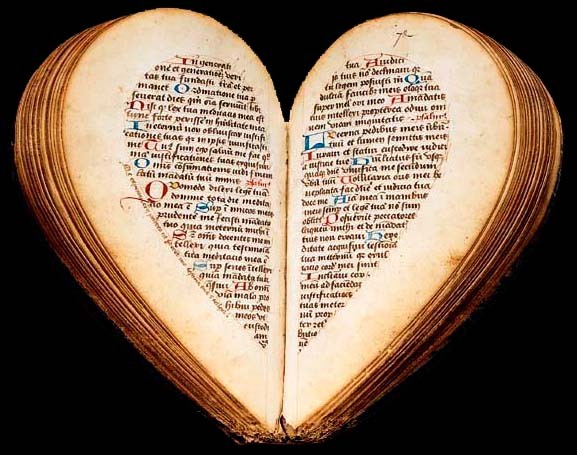 2973) was another heart-shaped medieval songbook, this one French from the 1470s. According to Eric Jager in an excerpt from his book The Book of the Heart, cordiform manuscripts were often songbooks containing love songs – for obvious reasons, I think. Jager also points out that the Chansonnier Cordiforme is the only surviving cordiform songbook to be illustrated. The manuscript depicted at the top of the post is a book of hours made in Picardie, France in the 15th century; it is the Bibliotheque Nationale de France’s MS Latin 10536. The image below is a facsimile of the Chansonnier Cordiforme owned by the University of Cincinnati Libraries’ Rare Books Collection. Facsimile of the Chansonnier Cordiforme (BnF MS Rothschild, Occ. 2973). Facsimile made by Vicent García Editores of Valencia, Spain in 2007 and owned by the University of Cincinnati Libraries Rare Books Collection. Wow! What a find! My first book of poetry’s title is Season of the Heart. If I OK a second edition I may just request a hardback version like this ! Was fur ein idee! How intriguing! Thanks for putting this up!